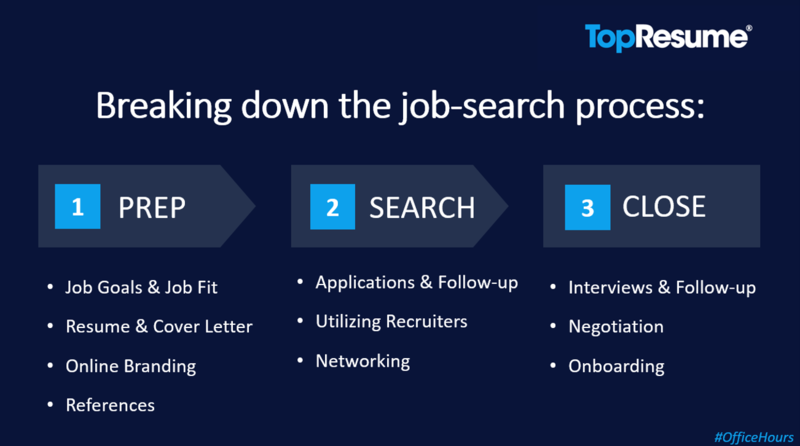 TopResume's career advice expert tackles how to jump-start a stalled job search. A big THANK YOU to everyone who participated in our latest edition of #OfficeHours, presented by TopResume! You asked some great job-search questions, and it was an honor to offer my job-search advice and career tips. Below is a transcript of the beginning of our Facebook Live event, along with some of the most popular questions that were asked and my responses. I also went a little deeper into the questions you should ask yourself the next time your job search stalls. Please like us on Facebook to learn about our upcoming events. Hi, everyone! Thanks for joining me for our second installment of Office Hours, presented by TopResume! My name is Amanda Augustine and I'm the career advice expert for TopResume, the largest resume-writing service in the world. You can request a free resume review at any time by visiting our site at TopResume.com. To give you a little background, I joined TopResume about two years ago as their resident career advice expert. I’m a certified professional career coach (CPCC) and resume writer (CPRW) by trade, and have worked in this industry for nearly 14 years. Together with TopResume, our goal is to host a live event each month to give you a chance to ask the job-search questions that matter most to you. If you haven’t already, please take a moment to “Like” TopResume’s Facebook page so you never miss an upcoming event. The topic for today’s Live Chat is all about how to get out of a stalled job search. Whether you took a few months off from your search and are just getting back into the swing of things, or you feel like you’ve been searching FOREVER and just aren’t getting results, today’s the day we’re going to get your job search moving in the right direction! Q: Are my job goals clear and realistic? 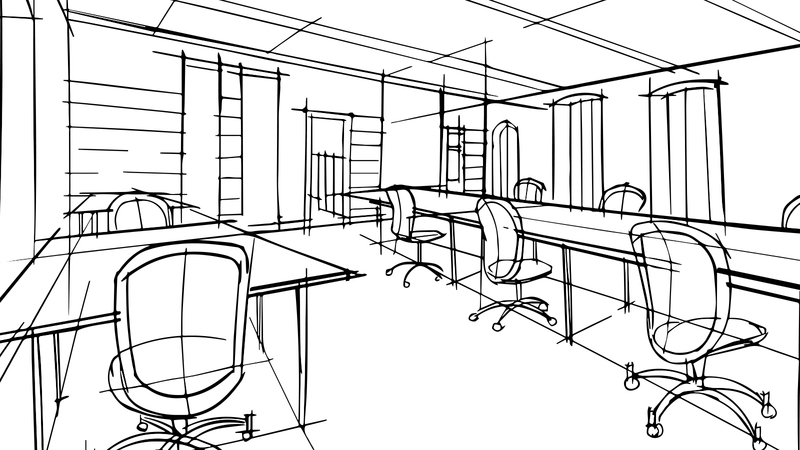 A set of well-defined job goals is the foundation for an effective job search. Your job goals will help you decide what information to highlight on your resume and LinkedIn profile, how to prioritize your networking connections and activities, and how to position your experience when you're pitching your skills to networking connections and prospective employers. If your job goals are still a little fuzzy, give these job-goal exercises a try. Q: Am I customizing my resume and cover letter for each position? Many employers use applicant tracking systems software (or ATS, for short) to screen resume applications as they are submitted, rank them based on their information, and send only the most qualified candidates over to the recruiter or hiring manager for review. If your professional resume contains the same keywords that routinely pop up in your target job description, your application is in a better position to get past this digital gatekeeper. Click on the following link for step-by-step instructions to customize tailor your resume for a job listing using resume keywords. It's important to note that you shouldn't overhaul your resume every time you submit a job application. Ideally, you should have a well-defined, specific job goal, so most of the job listings for which you apply should contain similar keywords and requirements. Collect a few job descriptions that reflect your current job goal and make a list of the keywords that are repeated throughout these job postings. Oftentimes, these keywords reflect the hard and soft job skills that are required to do the job well. It could also include technical proficiencies and industry-specific terms. It's safe to say that if these words and phrases are showing up on multiple job posts in which you’re interested, then they should be incorporated into your resume. Think of the resume customization process more like an evolution, rather than a complete resume rewrite for every job application. You may swap out a few resume keywords in the core competencies section and make slight edits to the content of your career summary and professional title at the top of the resume. Q: When was the last time I Googled my name? In today's marketplace, it's not enough to have a great resume and cover letter. Employers also want to investigate your online brand before offering you the job. In fact, a study by Jobvite found that 93 percent of recruiters will review a candidate’s social profile before making a hiring decision. If you’re not managing your personal branding, you could unknowingly hurt your chances of landing your dream job. Make sure your online presence is supporting the story being told in your resume and cover letter. Download a copy of my free personal branding checklist to get started. Q: Am I applying to the right jobs? How often? When done correctly, submitting a job application can be pretty tedious and time-consuming. The last thing you want to do is spend all that energy applying for a role that's not a good fit. Before you apply to another position, ask yourself these seven questions. Then, make sure you're customizing your resume and cover letter for each job application and leveraging your network to improve your chances of getting a callback. Also, be sure to keep an active pipeline of job leads. The worst thing you can do is to get so excited about an upcoming interview, you stop seeking out and applying to new job listings. In fact, I recommend finding a new, well-fitted job and applying to it the same day you land an interview. This will ensure you keep your job-search momentum going, regardless if that interview works out. While there isn't a specific job application goal I can offer that will guarantee a job offer, it's important to continuously mine for new job opportunities, on and offline, and pursue them on a weekly basis. Q: How often am I networking for work? If you've only been applying to positions online and are getting nowhere, networking may be the key to improving your search. More than one study has found that you are 10 times more likely to land a job when your job application is accompanied by an employee referral. However, to land these coveted referrals, you have to invest in your network. Your best bet is to find people who work for the company you're targeting, such as a friend, former colleague, fellow alumnus, or friend-of-a-friend, and request an informational interview. These casual conversations can provide a goldmine of information to help you decide if the company is a good fit, better understand the company's hiring and interview process, and hopefully set you up with an employee referral so your application can skip over the initial gatekeepers and move on to the hiring manager. Q: Where am I getting stuck? Are you applying for job after job and never hearing back? Or, are you landing phone interviews without a problem but never making it to a face-to-face meeting? Or, perhaps are you making it to the final interview rounds but always ending up as the runner-up? Once you can pinpoint where your job search is getting stuck, it's easier to determine the right course of action to get your job search back on track. For instance, if you're feeling stuck in the resume black hole, it may be time to seek some professional help to rewrite your resume. Or, if your resume is solid, it may be a matter of reevaluating the jobs to which you're applying and the level to which you're customizing each job application. Use the questions above to diagnose your job search and figure out what's the next best step to unstick your stalled job hunt. I Aced the Interview. Why Didn't I Get the Job?